Professional safety is in danger of extinction. Safety professionals have become complacent and unfocused, ignorantly relying on an 80-year-old paradigm. Lazy gimmicks are substituted for the hierarchy of controls meant to be the foundation of the profession. A $10,000 investment in posters makes zero improvement in safety; a $10,000 investment in machine guarding upgrades can save lives. By blending philosophy, history, and psychology, The Fearless World of Professional Safety in the 21st Century is revolutionary, offering an innovative approach with creative solutions to move a safety program past the malarkey that has devalued professional safety for decades. 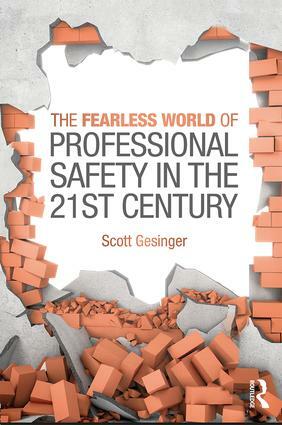 Using humor and professional experience within a discussion of historical events and published scientific findings, Scott Gesinger explores the history of how current safety practices developed and why these must change if the profession is to survive the 21st century. He discusses new professional philosophies based on best practices in industry, historical examples, scientific research outside of safety, and proven approaches from other disciplines which can successfully guide safety professionals into the future. Gesinger provides a book for every safety professional that is candid, plain-speaking, and eminently approachable, while at the same time provides information that is new, challenging, and engaging. 'Enlivened by personal thoughts and examples this book serves up a refreshing blend of arts, science, anecdote and research and provides useful stimulus in uncertain times to provoke thought and reconsider actions.' — Professor Andrew Sharman CFIOSH FIIRSM FInstLM, author of From Accidents to Zero, Safety Savvy and Mind Your Own Business. Does this make me Flotsam, or Jetsam? Scott Gesinger, CSP, is a safety engineer and writer in Minneapolis, Minnesota. He is a graduate of the University of Minnesota Duluth Master of Environmental, Health and Safety program and holds a Bachelor of Science in Psychology and Sociology from the University of Minnesota.